Doing business on the Internet is not much different from doing business anywhere else. If you are active and creative you will get success. If you have these two qualities it would be wise to use them to build traffic to your website. Getting traffic is not as easy as you might think. Although millions of people use the Internet, there are also millions of offerings out there. If you want to get a share of the visitors you will really have to work hard. To get you started here are some techniques that you can use to build traffic and also improve the search engine ranking of your site. There are so many advantages of good appearance of the website. if your website has many pages of information, then each one of those pages will be packed with words and phrases. That people will find when they use Google or Yahoo search engine to search your website. Even you can also check Evanto studio for the best looking WordPress themes. Another consequence in building an interesting site is that other sites will also get linked to your website, hence, the appearance of your website matters alot, as your site will be an important resource for them. In fact, Google also follows this when it set up the current ranking system. If you’re new to blogging or if you’ve built your very own website for your business, you’re probably wondering how to rank your website higher on Google. If your site is interesting people will tell their friends and they will check out your site. So, I suggest, never underestimate the importance of word-of-mouth. A content-rich website is the first secret of generating traffic on websites. Off-Page SEO plays a significant role to double my Website Traffic in a Month. I always publish content and some or the other information on other websites and generate backlinks. This is one of the most effective ways to build traffic. If the website is full of unique and useful content, then other people will also want to publish it on their websites. Below mentioned are few directories where you can publish your content (but make sure that you put your URL and contact information on each article, this is how you actually generate traffic on your website). Stumbleupon Digg Delicious Flipboard Triberr and many other Directories. It is very important to work on off-page factors that are related to search engine positioning. Your website ranking is partly determined by how many other websites link to your website. If you have published your content on directory submission sites, then you will get a good amount of important links. If not, then need to think twice, and you may need to launch a reciprocal links campaign or place your site in paid directories in order to increase the number of incoming links to your website. Improve the website’s search engine ranking by placing your important keywords, the focus keywords, meta tags and the description. Also use search terms in the title tag, the description tag, in your site’s headlines, and in link text on your web pages. 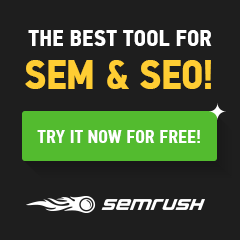 You can use Semrush for your website optimization. click the below image. These on-page factors of website optimization work wonderfully to me to double my Website Traffic in a Month. If you do this successfully your website’s search engine ranking will also improve for that particular keyword or keyword phrase. So why is social media so important? Should you use social media to drive the traffic to your website? Because people spend a lot of time on these networks, and that makes them the perfect medium for referrals and driving traffic to your website pages. Everyone needs more website traffic, choose the right social media channel for your business promotion. I always recommend using Social Media Plugins & Buttons in your website. Encourage your readers to share your content by using social media plugins. Don’t worry! You can manage all by either Shortstack or by Agorapulse in minimum rates. Also, find a unique voice on the right social media channels for the type of audience you want to build, is essential for driving growth. If you are serious about your content, then you also need to be serious about driving as much traffic to it (over social media) as possible. It will improve the click-through rate from social media to your website. This is exactly why businesses need to understand that sites can get huge traffic through Social media channels and leverage it to double up their business growth. Register for Workshop – “How to Leverage Social media to Grow Your Brand“. Use Google Analytics social reports to track your results in social media traffic and extract the next steps of your social media strategy from the “numbers” you discover. It’s highly recommended to invest some time in research and then choosing specific topics that really make sense for your niche and for your business. The hardest part is creating the quality and 100% fresh content. You see, not only do you have to create content around a topic, it’s equally important for you to create a content that’s 10x unique than your competitor. Maintain a very high quality of your stuff that will be helpful to get recognized. The below-mentioned infographic summarized all the preferred practice data for 10x content. Growing a site from 0 to 10K visitor a month is easily doable. It will surely help to increase the website traffic. As the bloggers also are likely to share the post content with their large and variety of audience. This is the best opportunity to add more & more variety of content. By visitors angle, it seems how active we are in our field. These are the few top strategies, that you can use to drive huge traffic to your website. Even I’m also using the same method to double my Website Traffic in a Month!! The topmost & my first choice for keyword research is the Google AdWords Keyword Tool. You need to simply enter the keyword or keyword phrase for your website or blog. This tool will show you all the related keywords phrases along with their search volume. Do you want to know what keywords or keywords phrases your competitors are ranking for? OR wantto know traffic compares with your competitor? SEMrush is one of the premium SEO tools that allows marketers to analyze and research their competitor’s keywords. Both in an organic (normal results displayed in search) and paid search. WordPress SEO by Yoast is a free plugin including sitemap creation, an addition of Meta tag fields (title, meta description, meta keywords) for your posts and pages, and SEO analysis of your content. So, if have your own website or a blog in WordPress, Yoast SEO is the right choice. SEOprofiler is a full-featured website promotion tool that offers everything that you need to get high rankings on Google and other search engines. Creativity combined with activity is a good recipe for traffic building on any website. Build your website as best you can, and then spread the word about it. Use my these 4 tips I used to double my Website Traffic in a Month and you are sure to succeed. Themeisle is a Premium WordPress Themes, Templates & Plugins developed by ThemeIsle. They are the creators of Zerif Lite theme, which considered as #1 Free WordPress Theme in 2018. I hope you like my blog “How do I double my Website Traffic in a Month” and get value out of it. Please share it with others and sprea the knowledge.